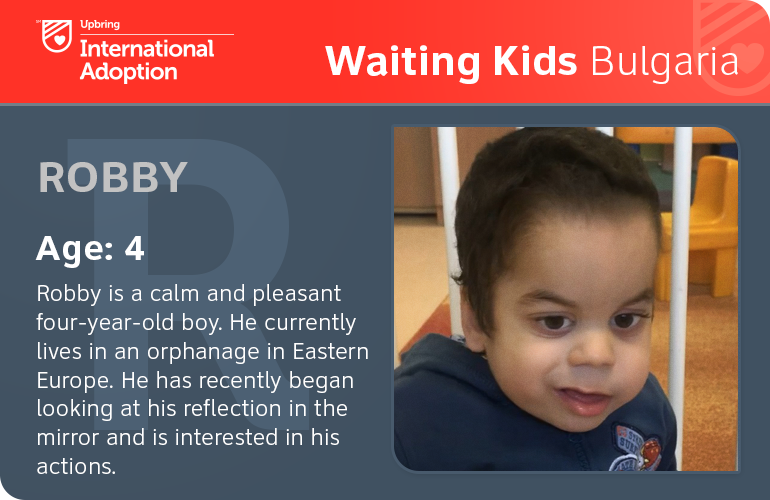 Robby is a calm and pleasant four-year-old boy. He currently lives in an orphanage in Eastern Europe. He has delays in his Neuro-psychological development. He has been diagnosed with intraventricular bleeding, nonspecific reactive hepatitis, muscle hypotonia, lack of speech and other issues. He is working with a speech therapist to refine his ability to speak. Overall, Robby is in good condition. He has shown progress in his general and fine motor skills. He can walk with support. Robby can play with cubes by putting them into and taking them out of a cup, but has some problems manipulating smaller objects. He enjoys throwing objects and chasing after them. He has recently began looking at his reflection in the mirror and is interested in his actions. He doesn’t show great interest in other children, but gladly accepts the company of adults. He enjoys receiving attention. He often prefers to play alone with his toys. He is well attached to his foster parent and responds well to her.